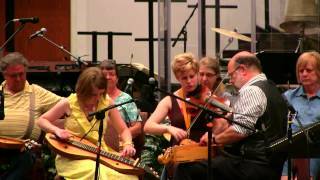 S·E·A Folkgrass - Owl Mountain Music, Inc.
S·E·A is comprised of long-time folk musician Steve Eulberg and musical sisters Erin and Amber Rogers. Steve met the sisters when they were just beginning to play their instruments. At first, the three met up occasionally at music festivals across the country and made it a point to play some tunes together. Steve has a thriving music career of his own, teaching private lessons and workshops, composing and recording folk songs, and performing concerts.